I suppose (if you've read this book) then you'll know why it goes without saying, that if you haven't, you should read it. My name was Salmon, like the fish; first name Susie. I was fourteen when I was murdered on December 6, 1973. My murderer was a man from our neighbourhood. 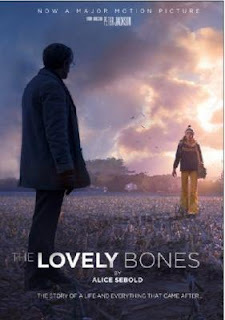 Watching from her place in heaven, Susie Salmon sees her suburban family devestated by her death, isolated even from one another as they each try to cope with their terrible loss alone. Over the years, her friends and siblings grow up, fall in love, do all the things she never had the chance to do herself. But life is not quite finished with her yet. This book was so much more than I expected. Usually when a book has been hyped (and it was hyped in the bookstores way before the movie came out!) so much I tend to avoid it like the plague, as they generally turn out to be not at all as good as what people say (hello Twilight!, Perfume! Harry Potter is the obvious exception). But this lived up to the hype. I would really like to see the movie now to see how they do it, as there are quite a few charcters in this book that I imagine the movie may have envisioned differently to me. I really liked the easy-to-read style, and the fact that, as it's written from a fourteen year old's perspective, the language is still quite simple, not like some 'literature'. The only thing I didn't like, was a little bit at the end, but I won't ruin it and say what, in case, like me, you've been late in picking up this book and actually reading it! Highly reccommend, this is one of those books you think of long after you've finished it. Great book- one of my favourites. I read this a few years ago and couldn't put it down. Definitely on my all-time favourites list. Not sure how the movie will handle it either. I loved the book but hated the movie. It just didn't focus on the parts I wanted it to focus on. Then again, that's what you get when you love the book....the movie rarely lives up.